Hose/Conveyors is uniquely positioned in the market place for the OEM. We’re very proud to have four highly distinguished departments, Hose assemblies, Precision Machining, Die Cutting and Belting. As Hose/Conveyors growth in the OEM market developed our clients continued to ask for more value added services. From making custom fittings, to specialty hose and belts, Hose/Conveyors has responded to our clients needs. Our clients have requested the highest quality, fastest deliveries and highest level of customer support. Hose/Conveyors delivers. The last thing our clients are attempting is vendor reduction. Through Hose/Conveyors they have accomplished that without diminishing the level of quality, service and support demanded. This department was first created to fulfill custom fitting requirements our clients had. 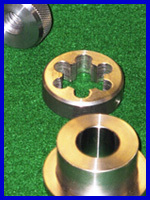 It has since developed into a full service, state of the art machining division. While custom fittings are still a small portion of the business the majority is handling precision machining needs our clients have. We handle our clients prototypes, short runs, high tolerance and general machining needs. Secondary operations include de-burring, hardening, heat treating, plating, stamping, laser marking, painting and grinding. Quality control is of the utmost importance and with the use of a Brown and Sharpe gage 2000 and various gage blocks, pins and micrometers, Hose/Conveyors continues to deliver high quality, service and support. Please visit the Precision Machining page for a complete listing of equipment and services. 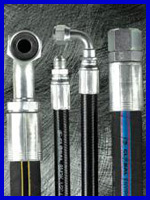 Hose/Conveyors shop specializes in OEM hose assemblies. Many of our clients have custom hose requirements that range from custom marking with their name and contact information on the hose to custom specifications and unique constructions. Hose/Conveyors partners with the premier hose manufactures in the world like Gates, Goodyear, Kuriyama and others, to meet our clients hose construction needs. With high speed automatic cutting equipment, high speed crimping, semi-automatic fitting pushers, hose assemblies are made quickly and accurately. 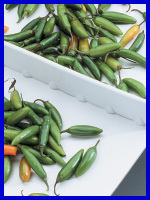 Secondary operation offerings include flushing, capping and packaging services. Quality control services include, special measuring equipment for crimp specifications, pressure testing equipment and pull testing equipment. Our clients are confident in receiving the highest level of quality, service and support. The Die cut machine was added in response to our client requests for the secondary operation of hole punching to conveyor belts. As with the machining division this quickly grew into a stand alone division. With all the rubber and thermoplastic products handled it was an easy fit into handling all of our clients die cutting needs. Our clients have come to expect and receive the same level of quality, service and support that is the trade mark of Hose/Conveyors. 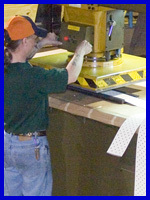 Please visit the Die Cutting page for a complete listing of equipment and services. Hose/Conveyors has one of the largest and highest throughput shops in the country. We’ve designed and built all our own equipment to manufacture the highest level of quality and throughput available. Our Belt products group is ready and able to assist in belt design and selection. Hose/Conveyors is very pleased that our clients consider us to have set the industry standard for quality and service in the belting industry. Please visit the fabrication services page under Belt Products for more details.